Tomorrow, Christie's is presenting a joint auction of all kinds of art and wine from France in a celebration of the country taking place in New York. Over at their rival Sotheby's, however, it is French furniture which is the focus for collectors, as The Collection of Suzanne Saperstein is set to be sold in New York on 19 April 2012. Collecting runs in the family with Ms Saperstein, as her Swedish great-grandparents were enthusiastic collectors of antique furniture and decorative arts. "After many years of collecting, living with and loving these objects, I feel that it is time for them to be enjoyed by a new group of owners," commented Ms. Saperstein. "I look forward to the new chapter of my life that will begin with the sale of Fleur de Lys - a time to be spent with my family and on my new pursuits." A Set of Six Louis XVI Giltwood Fauteuils and two matching Bergères, from circa 1780, was designed by the famed cabinetmaker Henri Jacob, and is notable for the chairs having five legs. It is expected to sell for $400,000-600,000. A pair of Louis XV Silvered-Bronze Swans, from1750 is expected to achieve the same price. The likely top lot, however, is a Louis XIV Ormolu-Mounted Boulle Marquetry Coffer on Stand which believed to have been given to Lord Cathcard by Louis XV. 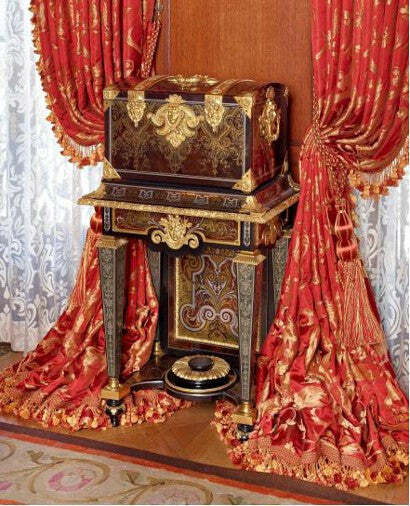 The most celebrated cabinet-maker of the day, André-Charles Boulle, created the piece and it is expected to sell for $800,000-$1.2m.